With Brexit controversies and uncertainties still brewing, the UK may not appear to be an obvious choice for investors looking overseas for growing companies. However, Brexit or no Brexit, the UK is well established as a world capital in entrepreneurship, research and development, and business investment. In 2016, venture capital firms invested £6.8 billion ($8.5 billion) in UK companies, contributing to a total of £30 billion invested over the past 5 years. Here are just a few of the reasons why these investors and others are making the UK their investment destination. According to an EY report, London is second only to Silicon Valley in tech investment. Startups in the capital benefit from a large pool of highly educated, international talent, a conveniently central geographic location in the world and a thriving, concentrated alternative funding market of venture capital firms, business angels, incubators and accelerators and more. London’s history as a magnet for international investment may go back even further than that of its US counterpart. Since EY’s survey began in 1997, the city has been named the most attractive among foreign investors, beating out Paris, Amsterdam, and Berlin by a wide margin. The survey data demonstrates that the UK capital has been a consistently excellent incubator for high-growth companies. The UK has a strong culture of entrepreneurship. Home to over 5.5 million businesses and 18 unicorns, the country saw 660,000 new companies founded in 2016 alone. The government encourages this culture by keeping the barriers to business ownership low – it is possible to register a company within 48 hours – and providing tax relief for innovative businesses and for investors in new companies. Businesses proven to be undertaking R&D, for example, can re-claim up to 33% of their costs. For investors, the EIS and SEIS schemes offer generous relief of 30-50% on investments in growing, higher-risk companies. The UK has long been seen as a convenient (and English-speaking) gateway to the rest of Europe. While this connection will likely change with Brexit, the UK’s geographical and cultural proximity to the continent is an undeniable advantage for companies with the potential to expand to European market. This means that investors can expect UK companies to harness not only the nation’s own population of 65 million people – a large market in its own right – but also, potentially, the European market of more than 740 million. As you can see, the benefits of investing in UK businesses extend far beyond the nation’s convenient use of the English language and its long history of innovation and economic power. 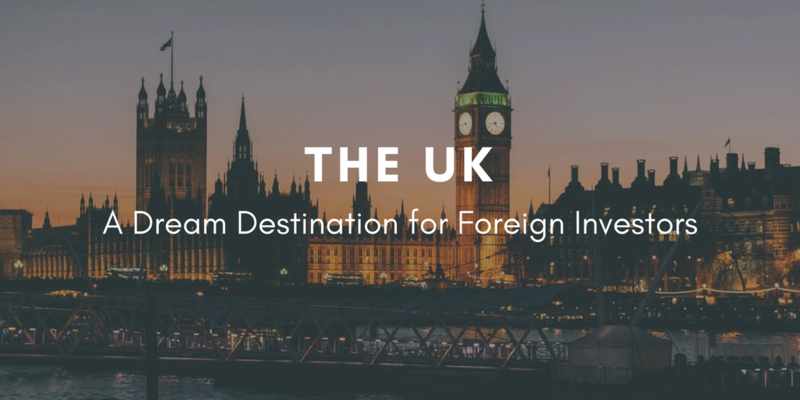 The superb business conditions described here may be the true motives of foreign entrepreneurs and investors – from Silicon Valley, China, India and beyond – who are making the UK their second home. Do you own a small or mid-sized business? Are you looking for funding? The Business Funding Show 2018 will bring a range of traditional and alternative funders together under one roof in one day to meet you and help you discover your ideal funding solutions and how you can secure them. The only funding expo in the UK and EU, the flagship Business Funding Show will take place on 22nd February 2018 and feature leading industry bodies such as London Stock Exchange, UKBAA, BVCA and British Business Bank; equity investment platforms SyndicateRoom, Crowdcube and Angel Investment Network; venture capital firms Atomico, Albion Capital and Beringea; business service providers Pitchbook, Innovate UK and Granted Consultancy; and many more! More details and tickets are available at https://www.bfsexpo.com/.